Many Shogun Warrior Collectors are unaware that the missile-firing hands of the jumbo-sized Mazinga, Great Mazinga and Goldorak were actually an accessory bought separately in Japan. I think it was easier to package the missile-firing hand than recast Mazinga without the missile holders on his shoulders and legs, or try to package missiles separately with the hand-accessory. Or it may be that while the figures are impressive, in market testing there just wasn't enough action to the Shogun Warriors so they decided to supply some extra bits. The shooting Axe-fist (Iron Cutter) of Raydeen was also bought this way in Japan, but was thought of as an "added play value" feature for US consumers of the bow-fist.The star shooter was also a separately purchased accessory in Japan that came with a strap (as did the Mattel first issue Dragon) instead of the clip-into-slot of the later issue Dragun. Note that the accessories I own link to a page with additional photos in the Accessory Title; or you can click the thumbnail of the box lid graphic from my Popy Brave Raideen. This arm had a pivoting elbow to ease the aim of these cool satellite flying discs. Way cool! This arm has a telescoping magnet that allows a Jumbo Machinder to pick up metal items at his feet. A car garage on an arm...why? Who knows? This arm fires small plastic balls. This light-up laser toy makes pulsing sounds as it fires. The tank would attach to the Jumbo's back and be filled with water, which would squirt from the small nozzle that fits into the hole of a Jumbo's hand. Fire extinguisher? Acid Squirter? I'm not sure of its make-believe function. Why yes, every jumbo needs a vehicle to cart him around, right? Not really sure about the purpose of this accessory, but seems to be a use-timer for the various accessories before they should be replaced by another. Once again, these are pretty basic shooting fists with Iron Cutters. Mazinger Z's Backpack for when he needs that extra power to get him someplace fast. In the manga and anime, the Mazingers could break open their arms at the elbows to expose a deadly pulse ray. These arms provide the effect. The "ZZ" sets came with a paper score-card with each of the accessories represented on it. Also, each accessory came with a self adhesive sticker that could be applied to the score card. 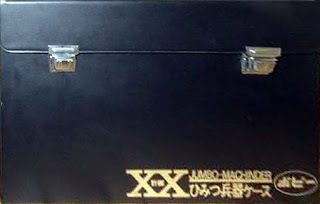 When all 8 accessories were bought and their stickers applied to the card, the card could be used as a coupon to buy a deluxe "jumbo machinder" vinyl case. The case has two doors so the jumbo could safely be stored inside. Along each side were plastic clips that could each hold an accessory fist. This set included a left Flying Fist (notice the "fin" to aid in flight!) and a right Iron Cutter, both on red launchers. This is one of the more desirable sets since these capabilities were actually used in the manga and anime. This set included a Missile Firing Fist (the same as the US version that came w/Mazinga except with red & black missiles) and a right Break Away Fist that held rockets and launcher. The Crossbow attachment would shoot projectile "v"s and swords. The sword (blue instead of red) is an extra that would fit any Jumbo's hand and the boomerang is an extra chest "v" that could be held in the fist, or fired. This huge missile-firing hand shoots 3 large polyethylene missiles. It's supposed to be a "Super shooter." This deluxe flying fist shoots twice, once from the wrist and again from the arm. Apparently, one could mount a bunch of fists to this fort to fight off attackers or use it to simply store extra accessory fists. The "jet-pack" accessory for Great Mazinger - it could also fit on some other jumbo machinders. Scramble Dash (came with Unifive Great Mazinger). There's also a knock-off. I believe only U5-A, U5-C and U5-Z were actually produced?